At this point, not all that much has changed leading into the release of Oscar nominations tomorrow morning. This weekend saw two major award announcements, the first two huge guilds to weigh in with their thoughts on who we should be watching out for this coming March. The Producers Guild of America got the ball rolling on Saturday, giving Guillermo Del Toro's throwback romance/monster movie The Shape of Water a rather large feather in its cap. The Shape of Water has received plenty of love this season, with this marking its second big win after taking home the top prize at the Critics' Choice Awards a week and a half ago. The Screen Actors Guild Awards, on the other hand, pretty much followed in lock step with the Golden Globes and the Critics Choice Awards for the acting categories, giving their top prizes to actors who had all previously won a Globe. 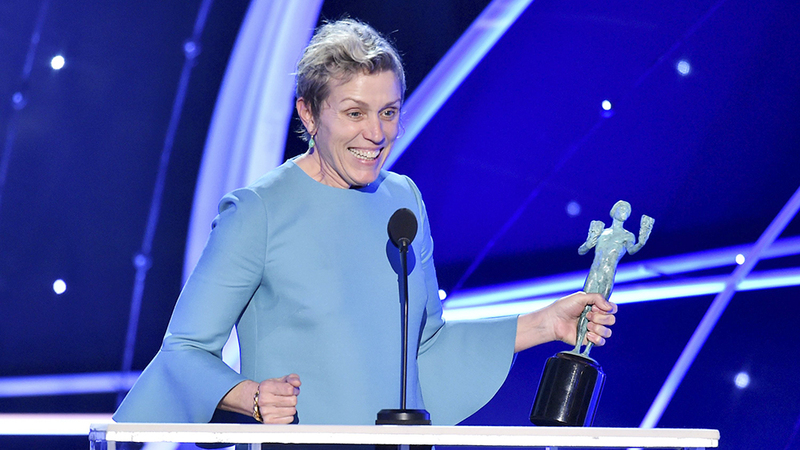 There's no question now who the front runners are in the four major acting categories, with Gary Oldman (Darkest Hour), Frances McDormand (Three Billboards Outside Ebbing, Missouri), Allison Janney (I, Tonya) and Sam Rockwell (Three Billboards), Their Best Picture choice (which for the SAGs is the Best Ensemble category) went to Three Billboards. And now we have a race. And it's a strange one. There's no doubt at this point that the two movies out in front are Three Billboards and The Shape of Water (with Lady Bird and Get Out shrinking in the rear view mirror), which could make for one of the stranger lead-ups to the Oscar telecast in some time. You'd think that The Shape of Water remains too undeniably weird to have any shot at awards, and I think that the stuffy Academy that decided to go with The King's Speech over The Social Network or Black Swan (yep, still bitter) might not have given much more than token nominations for an inter-species romance monster movie, but the Academy has gotten younger and more diverse in the years since then, allowing for some more left of center films to get a boost. And Pan's Labyrinth did win plenty of technical awards, but its subject matter wasn't nearly as taboo or off the beaten path as The Shape of Water is. It's well-placed in a way, as Del Toro remains the front-runner for director, and the DGA announcement in early February should keep its momentum going. And Three Billboards won't be winning anything at the WGAs, as it was ineligible, though it's unlikely The Shape of Water would prevail there. The WGAs could see a huge victory for Get Out or Lady Bird most likely, giving them a nice opportunity for some time in the sun. I'll check in later this week with some thoughts on the nominations on the off chance something exciting and unforeseen happens, but I'm not holding my breath.